I love our morning basket. It’s become a beloved time by all of my children and it’s a time that I look forward to. 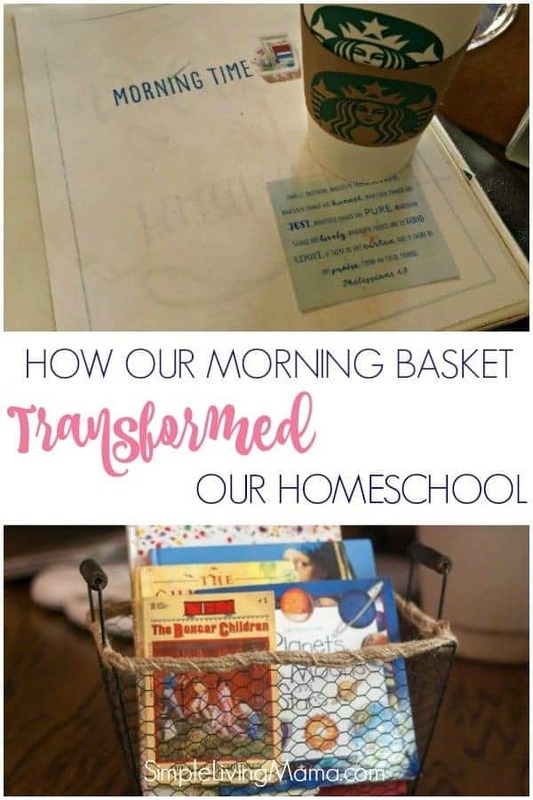 I wish I had known about a homeschool morning basket from the beginning of our homeschool journey! Even if you’ve been homeschooling for years, you can begin utilizing a morning basket now. It will transform your homeschool, I can almost guarantee it! When my kids are telling me that morning time is their favorite part of our homeschool day, I know we are doing something right! What Is a Homeschool Morning Basket? I first learned about a morning basket when I stumbled upon Pam Barnhill’s eBook, Your Morning Basket, which is now Better Together. At the time, I didn’t full on implement a morning time schedule. I kind of just pulled books that I wanted to read, most from our My Father’s World curriculum, and threw them in a basket. We did preschool work, Bible, and history readings before we started on independent work. After reading Barnhill’s book a little more closely, I decided to full on implement a morning time loop schedule and truly add truth, beauty, and goodness to our morning time through a variety of books and activities. What our morning time has become is more than I ever could have imagined. It is the essence of our homeschool. It is the reason why I wanted to homeschool. All of my kids can sit together with me and soak up so many wonderful ideas. Most of these subjects are not done everyday. That is where my loop schedule comes in. I love it! Basically, I choose a few subjects for daily work, and the rest is done on a loop. We usually do two extra subjects per day, depending on moods. Our daily work consists of Bible stories and/or devotions, memory work which is a nursery rhyme for my youngest learners, skip counting, 50 state memorization, etc, map work, poem memorization for my older kids, and read-alouds. We are usually always working on a chapter book and I usually read one or two picture books to my younger kids. I have an idea of what days each subject should be done, but the beauty of the loop schedule is that it doesn’t have to be done that day. We just do the next thing. Our morning time can last anywhere from 15 minutes to an hour depending on everyone’s moods. Our chapter book read-aloud honestly usually gets done in the evenings before bed. Once we finish our morning time, the kids move into their independent studies. Most of our morning basket activities just include reading great books and discussing them. Occasionally we add in some fun hands-on activities. One of our very favorite activities has been the Chalk Pastel Lessons from You Are an Artist. My kids have had so much fun creating different masterpieces based off of the lessons with Nana. I highly recommend them! Would you like to take a peek into our morning baskets? Each month I am showing you what’s in our morning basket so you can get an idea about what we are studying! You’ll also want to be sure to subscribe to my YouTube channel to see the videos that go along with them!